What does Switzerland, West Marin, a Fire Chief dying at a fire, a fatal train wreck, one of the most decorated World War II pilots in the US Navy, and a Cal Fire Chief officer have in common? 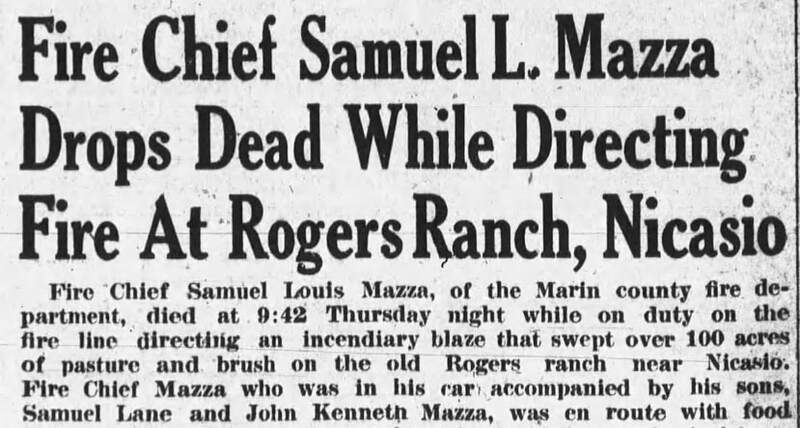 Let’s take a closer look at the life, story, and extended family of Samuel L. Mazza, who died in the Line of Duty at a 1948 wildland fire in Nicasio. Samuel Louis Mazza was born in Tocaloma on November 12, 1887, to Luigi and Lucia Mazza. Luigi and his wife Lucia, maiden name Giacomini, also from Switzerland, raised eight children on the Tocaloma family farmstead: Romildo, William, Nelly, Olympia, Alma, Samuel, and Kate, and an adopted daughter Dina. Luigi lived to the age of 81, and Lucia to age 85. The population of Marin County at the time of Samuel’s birth was roughly 12,000 people, less than 5% of the 2017 total, or about the equivalent of the City of Larkspur today. One of the earliest European-descendant settlers of that area of West Marin was Samuel Penfield Taylor, for whom Samuel P. Taylor State Park is named. Taylor was the son of a papermill owner in New York, and in 1849 at 22 years old, set sail on a schooner for San Francisco, attracted by the Gold Rush. He initially made his living selling meals on a beach, after finding a "hogshead" of eggs, or wooden cask, floating in the bay. Food sales went well, and with the profits he and a partner soon opened a lumberyard in San Francisco. In 1852, Taylor left for the mining location called Hawkins Bar in Tuolumne County, and struck it rich with gold, netting the equivalent of over $400,000 today. He used the money to buy 100 acres in West Marin, from Mexican Land Grantee Rafael Garcia. Taylor then opened the Pioneer Paper Mill near Lagunitas, in what would become Taylorville, not to be confused with Taylorsville in Plumas County. The paper business boomed, offering lower cost paper to the San Francisco area newspapers than east coast sources, which had higher shipping costs. In 1874, the North Pacific Coast Railroad built a narrow gauge rail line from Sausalito through Marin, with one line going on to Point Reyes, Tomales Bay, and Cazadero. In addition to moving freight, tourists loved the area, leading Taylor to establish Camp Taylor Resort, one of the first recreational camping sites in California. The site featured not only camping, but hunting, swimming, fishing, boating, and a dance pavilion. Taylor died on January 22, 1886, roughly two years before Samuel Mazza was born in nearby Tocaloma. Taylors family lost the Mill in the American "Panic of 1893", a severe economic depression, caused in part by railroad overbuilding, and then a series of bank failures. Unemployment reached 20% during the multi-year depression. Luigi Mazza was born in Switzerland on April 12, 1837, and at 17 years old may have immigrated first to Australia, although historical records differ somewhat on that route. Another source indicates he came through New York, and then came to California in 1854. Research will continue to determine his immigration path. Swiss immigrants in that era were seeking a better life, usually attracted by lands in the newly European settled territories of Australia, New Zealand, Angentina, Brazil, and the United States. Regardless of the routes of his immigration, we know that Luigi Mazza purchased land in Marin County in 1869. He settled permanently in the County in 1873, at the age of 36. Luigi built a home for his growing family, and made his living running a successful dairy and farming business in Tocaloma, most likely serving customers such as the nearby Camp Taylor and the Mill. 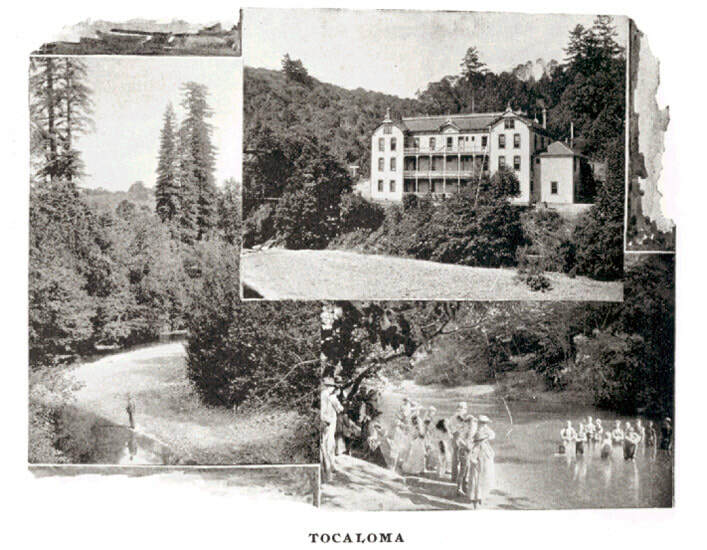 Tocaloma in 1887 was a thriving town, with its own large hotel recently rebuilt after a fire, the Bertrand, and the adjacent Northwest Pacific Coast Rail line. Luigi Mazza's success eventually led him to purchase more land, including over 844 acres at Rancho Olompali in Novato, and over 582 acres of the old Rancho Nicasio. He leased his Rancho Olompali land to oldest son Romildo Mazza in the early 1900's. Romildo would go on to farm 45 acres, and also ran 100 cows on the remainder. He also kept heavy horses on the ranch, and did some business in poultry. Romildo married Jennie Soldati in 1906. Her older sister Corina married Louis Pomi, apparently a distant ancestor of current Kentfield Fire Chief Mark Pomi. Samuel Mazza was 16 years old in 1903, when he experienced a disastrous train wreck just north of Tocaloma, opposite the Mazza Ranch. The train had been running behind schedule, and it was believed to have been speeding to make up time. 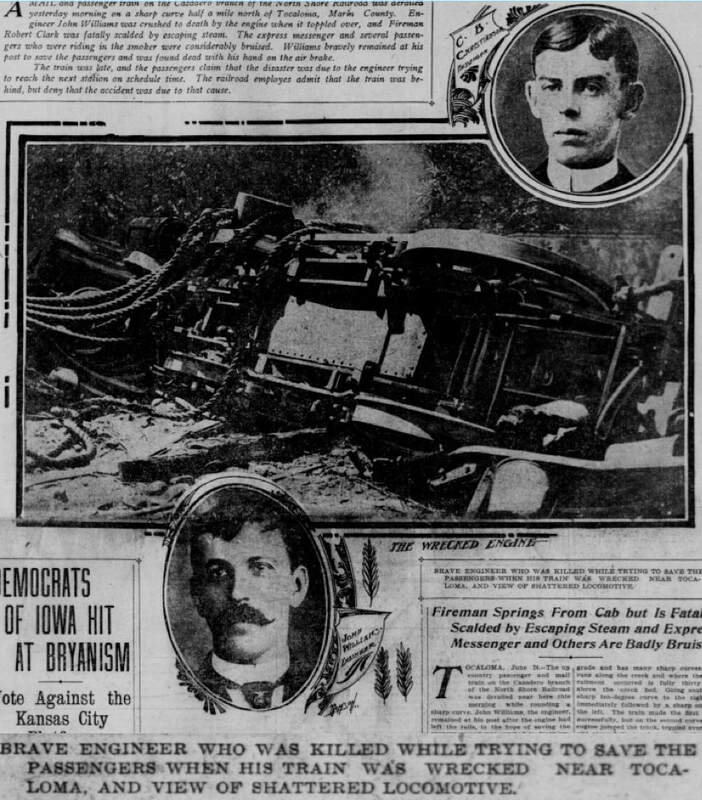 The wreck killed train engineer John Williams, and badly burned train fireman Robert Clark, who later died. A train “fireman” was the worker who tended the boiler on steam locomotives, including shoveling coal into the fire. In May of 1916, when Samuel was 29 years old, ﻿the Pioneer Paper Mill burned down in nearby Taylorville. Seven months after that large fire, the Bertrand Hotel in Tocaloma also burned down﻿, ﻿on the day after Christmas﻿. We can only wonder if these disastrous experiences helped influence Samuel Mazza later in life, when making his decision to enter the fire service. His son Samuel married Irene H. Lane of San Francisco on November 18, 1920. They settled in Tocaloma, where he worked on the Mazza Ranch. Research about the Mazza family has revealed many connections to prominent Marin, Sonoma, and San Francisco County families, including doctors, sheriff’s, ranchers, farmers, fire service veterans, and a World War II hero. Samuel's sister Alma Mazza married Clorindo Bloom in July 22, 1909, the son of Joe Bloom, a well known businessman of the North Bay. They married at Our Lady of Lourdes Church in Olema, with the wedding breakfast held the next morning at the Betrand Hotel in Tocaloma. Their son Louis Bloom, Samuel's nephew, would later serve as the Marin County Fire Chief from 1962 to 1971. Louis Bloom also served as a volunteer fireman for over 20 years in both the Point Reyes and Olema VFD's, including time as Fire Chief in both organizations. A biography for Chief Bloom will be developed for the Marin Fire History project. In another example of family ties, Samuels' older sister Olympia graduated from St, Mary's College in San Francisco as a Nurse. She married Thomas Keating, brother of J.J. Keating, who served as Marin County Sheriff from 1910 until his death in 1929. J.J. Keating had defeated Sheriff Will P. Taylor in the election in 1910, the son of Samuel P. Taylor. Will P. Taylor would later serve as the Postmaster of San Rafael. Following the death of Sheriff Keating, Mrs. Keating was appointed by the Board of Supervisors to finish her husbands term as Sheriff, the first and only female Sheriff in Marin County. According to local newspaper accounts, she mostly stayed at home while in office. Her son Richard was an active Deputy, doing much of the hands-on work. The Great Depression hit America in 1929, and Samuel and Irene Mazza moved from Tocaloma to San Anselmo in the early 1930's, where he purchased and operated a milk distribution route. Census records of 1940 indicate he was making his living as a carpenter and home builder. When World War II arrived, Samuel's younger cousin, Harold R. Mazza of Petaluma and San Antonio, joined the U.S. Navy. A graduate of the University of San Francisco in 1934, Harold was the quarterback on the 1932 and 1933 football teams. Harold would go on to be one of the most decorated Navy pilots in World War II, participating in many battles against Japan in the Pacific Theater of War. He initially served on the carrier USS Lexington (CV-2), nicknamed "Lady Lex", until it was hit by dive bombers and sank in the Battle of the Coral Sea. "The President of the United States of America takes pleasure in presenting a Gold Star in lieu of a Second Award of the Navy Cross to Ensign Harold Ralph Mazza (NSN: 0-83984), United States Naval Reserve, for extraordinary heroism in operations against the enemy while serving as Pilot of a carrier-based Navy Torped Plane in Torpedo Squadron TWO (VT-2), attached to the U.S.S. LEXINGTON (CV-2), in action against enemy Japanese forces on 8 May 1942, in the Air Battle of the Coral Sea. In spite of heavy anti-aircraft ﬁre and concerted enemy ﬁghter opposition, Ensign Mazza closed to within a few hundred yards of the target to execute a fearless and determined attack. Scoring a hit on an enemy aircraft carrier, he thereby contributed to the severe damage and probable destruction of the vessel and aided materially in the success of the operation. His outstanding courage and determined skill were at all times inspiring and in keeping with the highest traditions of the United States Naval Service." Harold later took command of the fighter squadron on the USS Bataan (CVL-29/AVT-4). As a dive bomber and fighter pilot, he also flew in air strikes on Tokyo, Hokkaido, Kyushu, Kobe and Kure. Towards the end of the war, Mazza was engaged in dropping relief bundles to POW camps in the Tokyo area, and patrolled Tokyo Bay by air during the Japanese surrender ceremonies. In 1946, Mazza took part in the atomic bomb tests at Bikini Atoll in the Marshall Islands. Participants and native islanders in the region were exposed to large amounts of radioactivity, later linked to internal organ damage and several types of cancer. His last assignment was as Assistant to the Naval Reserve Coordinator for Air Services on Treasure Island. ​Sadly, Harold Mazza died from a heart attack after the war in 1952, at age 43, while at home in Burlingame. We can only speculate that his death at a young age may have been related to the nuclear testing exposure. Read more about his commendations in the document below. 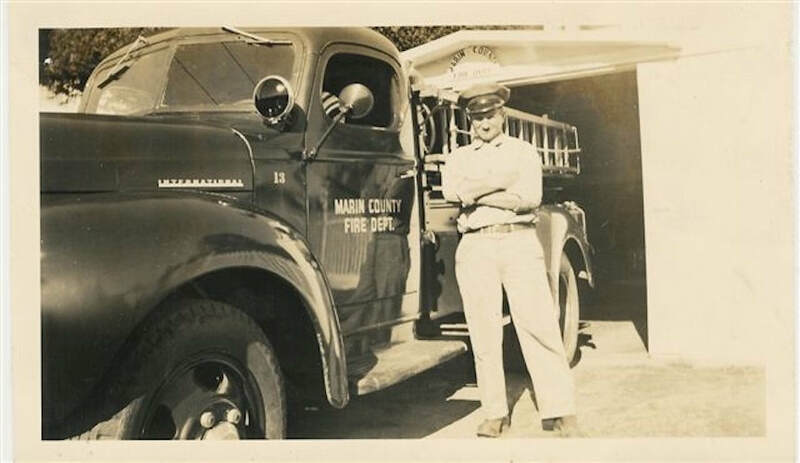 Samuel Mazza joined the newly formed Marin County Fire Department in 1942, less than a year after the formation of the agency. He quickly promoted to become the Assistant to Chief Lloyd De La Montanya. 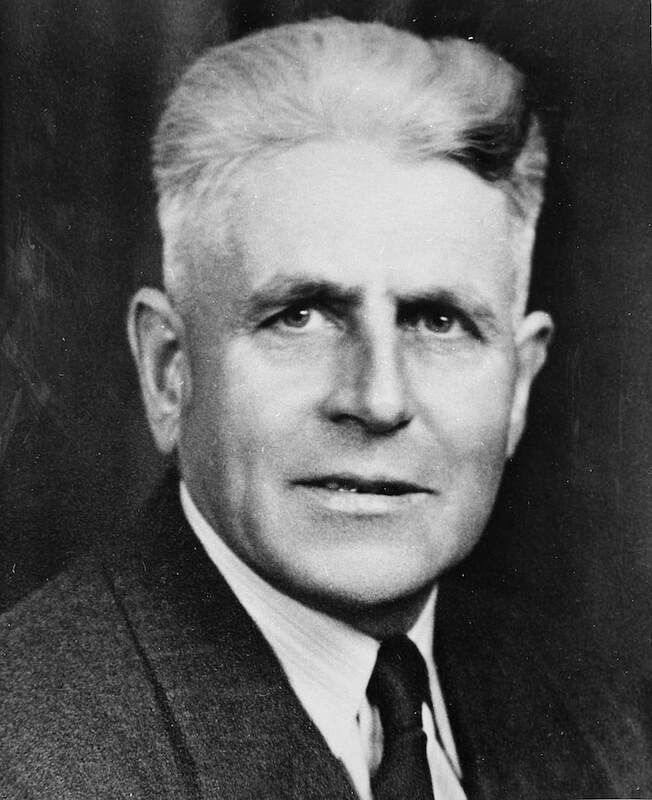 In 1946, De La Montanya stepped down due to poor health, combined with running out of sick leave. A U.S. Forest Service administrator named Charles Smith became the interim Marin County Fire Chief. However, Smith also stepped down a few months later, after being called away to other Forest Service duties. Samuel Mazza was then promoted to the position of Fire Chief by the Board of Supervisors. 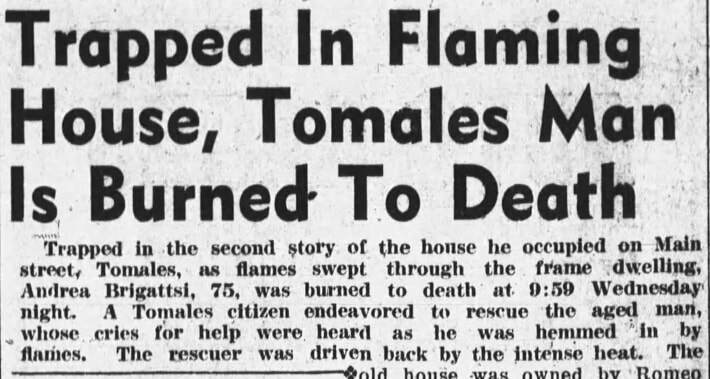 Chief Mazza, Assistant Chief Camillo Mello, and five trucks from MCFD responded to a structure fire in Tomales at 10:59 p.m. on Wednesday, September 1, 1948. A home owned by Romeo Cerini was destroyed in the flames, and resident Andrea Brigattsi died inside in the second floor bedroom of the small home. A neighbor tried to rescue him, but was driven back by the intense heat. A cause was never determined, but the chimney was suspected. Born in Italy, Brigattsi was survived by his wife, who had not yet immigrated from their native country. Remember that Italy had been devastated in World War II, so the circumstances most likely involved the husband immigrating to find a better life for them, and then saving up enough money to bring his family over. Chief Mazza was at scene of the Tomales fire until 2:30 a.m. After getting only a few hours sleep at the Mazza home in Woodacre, he drove to Petaluma in the morning for business regarding the Tomales fire. He was called to a grass and brush fire in Nicasio shortly before noon, located on the old Rogers Ranch. It was a very warm day, and while Chief Mazza was observed by others as not feeling well, he stayed at the command post. At some point he and his sons, Samuel Lane Mazza and John Kenneth Mazza, left to get food for the firemen. This was a common practice with Chiefs back then on working fires, as they often had the only vehicle that was not a fire truck, and also had the means to arrange for payment for the food for large groups. On the return trip they arrived back on the Ranch dirt road to the fire, and approached a steep ravine. Chief Mazza at that point asked his son to pull over, saying he was feeling sick. He was actually suffering a heart attack, and slumped over in the seat shortly after the car stopped. Efforts to revive him failed, and a responding Doctor pronounced him dead at the scene. The official cause of death was listed as heart attack, brought on by overwork and exhaustion. Chief Mazza died at 9:42pm on Thursday, September 2, 1948, at the age of 61. The fire eventually consumed 100 acres of grass, brush, and trees. MCFD fought this fire for over eight hours, using several bulldozers, 100 men, ten fire trucks, and volunteers from the Fairfax Boy Scout Camp, the St. Vincents School for Boys, neighboring ranchers, and the Volunteer Fire Department’s of Point Reyes and Nicasio. ​The Nicasio VFD had only been in existence since 1946, and may have been using their U.S. Army Surplus converted Half-Track on the fire. It was purchased in 1948, and the timing of it's arrival is not certain. “He was well liked and a fine citizen,” said a reporter in the Petaluma Argus Courier, “... he filled the office of Fire Chief most creditably and efficiently.” ​Arson was later determined to be the cause of this fire. The origin was found at two places on the ranch property, with paper placed in holes in the ground, and candles left burning inside. Samuel's wife Irene passed away at San Rafael General Hospital (aka Cottage Hospital) on December 15, 1950 at the age of 54, after failing health. She had been living with her son John Kenneth Mazza in San Anselmo, after her husband had passed away. Both of their sons, Samuel Lane Mazza and John Kenneth Mazza, were born and raised in Marin. ​Ken Mazza graduated from St. Anselm's School, and the College of Marin, and was initially employed by the Marin County Fire Department in the 1950's. His first job was manning the Mt. Tamalpais Fire Lookout, and of note had to have an emergency appendectomy in 1955, after being transported to the hospital from the lookout by an MCFD unit. Ken Mazza transferred to the San Rafael Fire Department in the late 1950's, and spent the remainder of his career there as the Fire Marshal. Ken's son Phillip Mazza would serve his career with the Tiburon Fire Protection District, more information and photos coming. The oldest son of Samuel and Irene Mazza, Samuel Lane Mazza, served as an officer in the Merchant Marines during World War II. The United States Merchant Marine provided the greatest sealift in history between the production at home, and the U.S. forces around the globe. Merchant ships faced danger from submarines, mines, armed raiders and destroyers, aircraft, "kamikazes," and the elements. About 8,300 mariners were killed at sea, 12,000 were wounded, with at least 1,100 dying from their wounds, and 663 men and women were taken prisoner. The total killed was estimated at 9,300 mariners. 66 died in prison camps, or aboard Japanese ships while being transported to other camps. 31 ships vanished without a trace to a watery grave. One in twenty-six mariners serving aboard merchant ships in World WW II died in the line of duty. This means the Merchant Marines suffered a greater percentage of war-related deaths than all other U.S. services. These casualties were kept secret during the War, to both keep information about their success from the enemy, and to help attract and keep mariners at sea. Newspapers ran pretty much the same story every week, along the lines of "Two medium-sized Allied ships sunk in the Atlantic." In reality, the average loss in 1942 was 33 Allied ships sunk every week. Samuel Lane Mazza survived the war, and married Geraldine Ellen Parker in 1950. The couple gave birth to son Samuel Lane Mazza, Jr. in 1951. As a young man he served as a seasonal firefighter under Chief Louis Bloom at the Marin County Fire Department. He went on to serve in the California Department of Forestry and Fire Protection (CDF), later renamed to Cal Fire. He promoted to be the Unit Chief in charge of the Cal Fire San Benito-Monterey Ranger Unit. After retirement from Cal Fire, Chief Mazza served as the Fire Chief in Monterey from 2002-2006, the interim Fire Chief in Salinas, and the interim Emergency Services Manager at California State University at Monterey Bay. 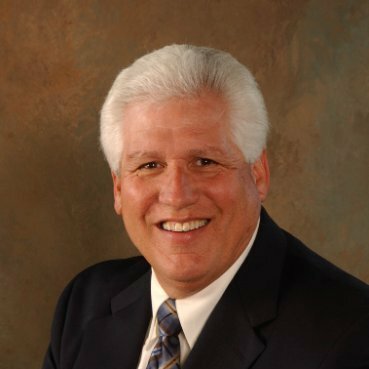 Now retired, Sam serves as an instructor at the National Fire Academy, and consults for Citygate Associates. His nephew Steve Yandell serves as a Captain in the Clovis Fire Department. In yet another "small world" connection, current Clovis Training Officer Bret Black was the Engineer on Steve's first engine assignment at Clovis. Bret was previously with Nicasio VFD as Training Officer, and was employed as a Captain with the Skywalker Ranch Fire Brigade prior to being hired at Clovis. Samuel Louis Mazza was also the cousin of a Marin County Medical Doctor, Dr. Ralph Mazza of San Antonio, and Corte Madera Attorney J.J. Mazza. And even another local fire service connection - Frenchie (F.A.) Mazza was the son of Romildo Mazza, and the nephew of Samuel L. Mazza. He served for 15 years as the President of the San Antonio Volunteer Fire Department in northern Marin/Southern Sonoma County. He hosted fund-raising BBQ's every year for the department, and passed away in 1976. Chief Samuel Louis Mazza is recognized at the California Firefighters Memorial in Sacramento. The listing appears to need correction of his middle name, from "Lewis" to "Louis." We will also be establishing a Marin County memorial recognition section in the brick walkways at the National Fallen Firefighters Memorial in Emmitsburg, Maryland, for all of those in Marin County who have died in the Line of Duty. More on that project coming soon. In summary, the family of Luigi Mazza provides a wonderful illustration of the old saying "...it's a small world..." Their record of public service is amazing, with four generations in the California fire service. May all of the departed family members including Chief Samuel Louis Mazza rest in peace. ​Thanks to our research sources and supporters, including Greg Jennings and Pete Martin, retired Senior Captains and Historians of the Marin County FD; Laurie Thompson and Carol Aquaviva of the Marin County Free Library Anne T. Kent California History Room; Author and Historian Dewey Livingston; Kentfield Fire Chief Mark Pomi, the California Digital Newspaper Collection, newspapers.com; the San Anselmo Herald, the Marin Independent journal, the Petaluma Argus Courier, the Oakland Tribune, Military Times Hall of Valor, and the Library of Congress collections, including census and military records. 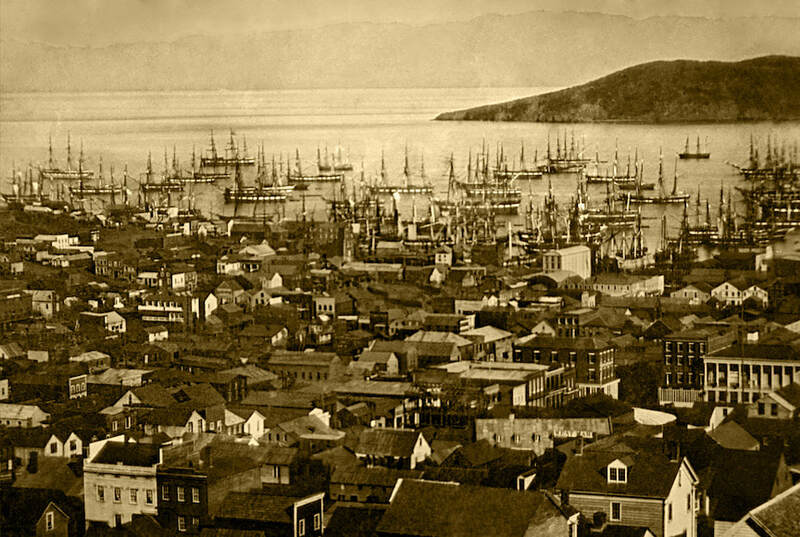 San Francisco around 1850, during the boom times from the gold rush. An illustration of the California Gold Rush. The Pioneer Paper Mill in 1856. 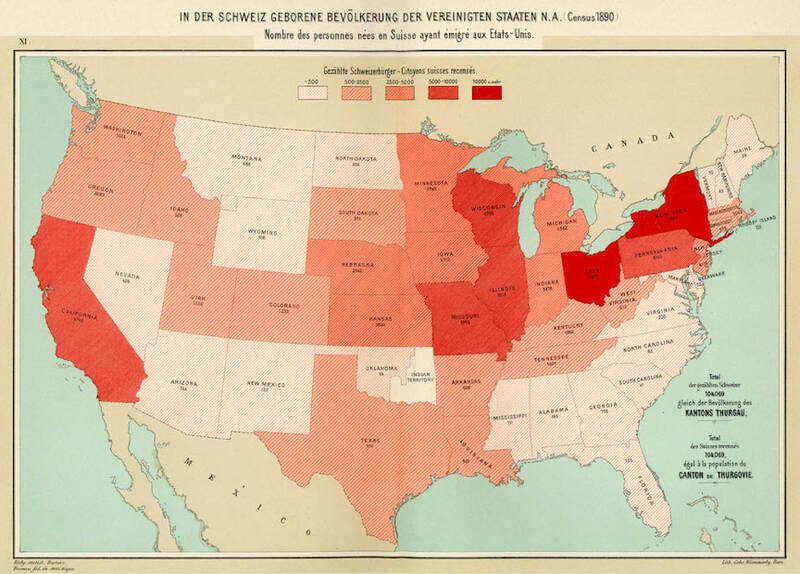 Swiss immigration locations to the United States by 1890, numbering 104,000 total by that time. Images from the train wreck in Tocaloma, San Francisco Call, Volume 94, Number 25, 25 June 1903. From the Petaluma Argus-Courier, Saturday, Nov 12, 1910. 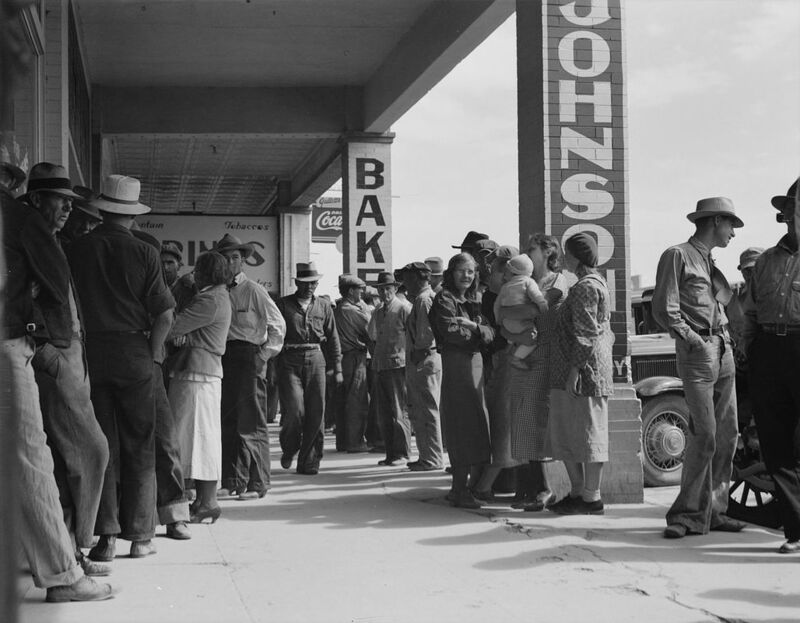 California citizens during the Great Depression, waiting for relief checks in the early 1930's. Photo by Dorothea Lange, image in the public domain , Library of Congress. 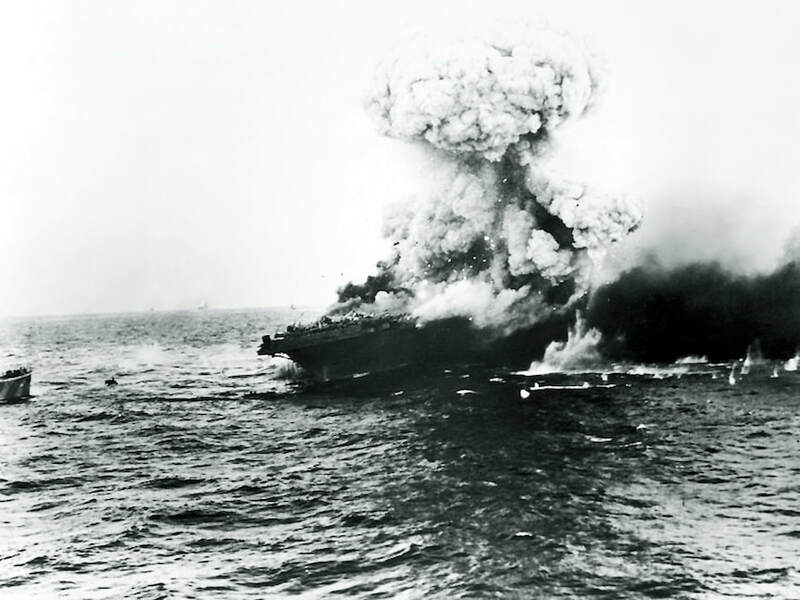 The USS Lexington explodes in the Battle of the Coral Sea on May 8, 1942, after being attacked and set on fire by 19 Japanese Shōkaku dive bombers. The Japanese Battleship Yamamoto, being attacked by American Planes on April 7, 1945, including one flown by Navy Lt. Commander Harold Mazza of San Antonio, cousin of Sam Mazza. The final moments of the Japanese Battleship Yamamoto, as her ammunition magazines exploded. 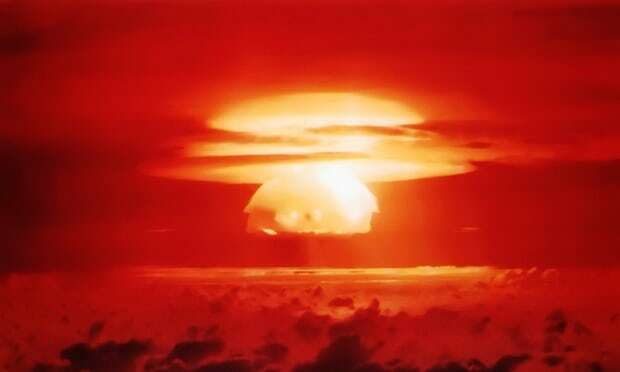 A government photo from one of the atomic and nuclear bomb tests at the Bikini Atoll area, starting in 1945 and continuing into the late 1950's. 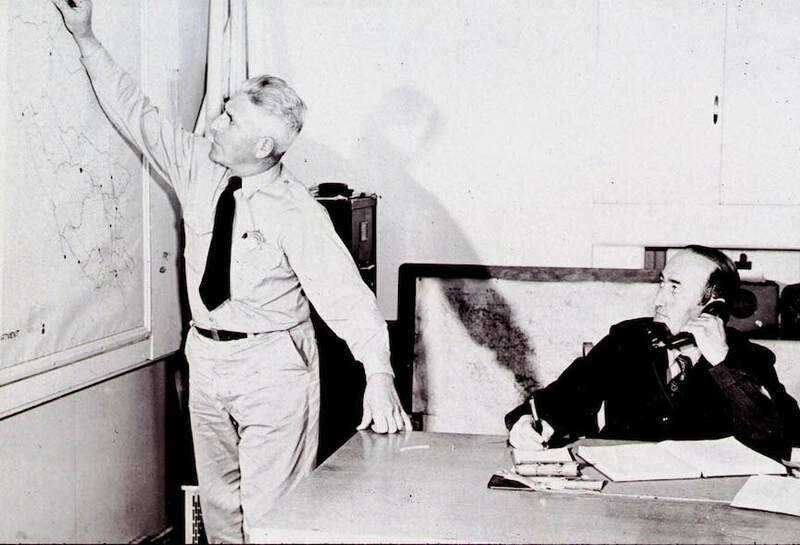 One of the earliest known photos of a member of the Marin County FD, Warden Cerrini, in 1941. 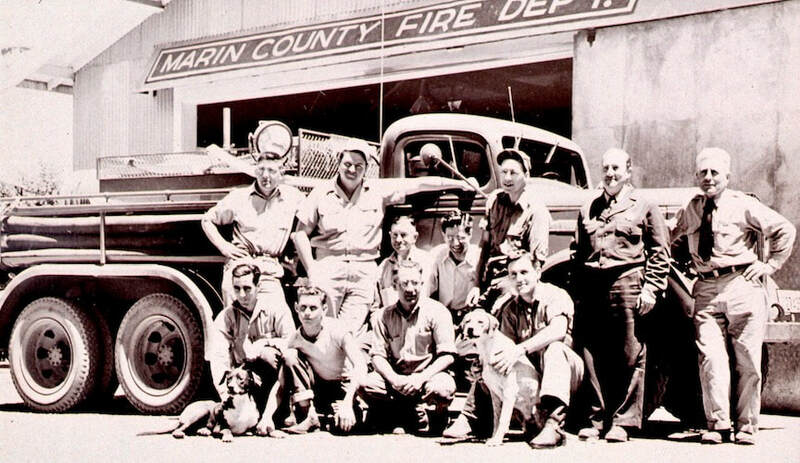 Marin County Fire Department circa 1947 or 1948, with Chief Samuel Mazza on the far right. Photo courtesy of Pete Martin and Greg Jennings, MCFD retired Senior Captains and historians. Chief Mazza on the left in the Woodacre headquarters of MCFD, unknown on the right. Photo courtesy Pete Martin and Greg Jennings. Nicasio VFD's half-track, converted for firefighting after being obtained surplus from the U.S. Army. Retiring San Rafael FD Fire Chief Clarence Johansen on left, with his guest Myrtle Davita. Behind the couple is San Rafael Fire Marshal Ken Mazza, presenting a memento to the Chief, in recognition of his retirement after 47 years of service. October 24, 1960. Chief Samuel Lane Mazza, Jr., Samuel Louis Mazza's grandson. Captain Steve Yandell, Clovis FD, nephew of Chief Samuel Lane Mazza, Jr.
A 1967 photo of San Antonio Volunteer FD members. Standing in the truck on the left is Henry Barboni, and Frenchie Mazza is on the right. Holding the gate are Joseph Pacheco and Jack Berlin. Unknown driver, San Antonio VFD historical archives. Part of the California Firefighters Memorial in Sacramento.